The children had so much fun at our Fall Festival on Halloween day. 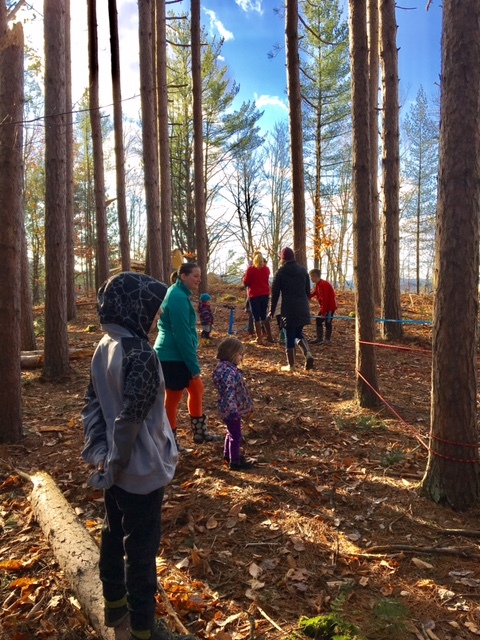 They played outdoor games, stuffed several scarecrows with straw, pressed cider, and enjoyed an enchanting woodland walk organized by the elementary children. The month of October has been so mild that is seems a shock to the system to be putting on coats, hats, and other warm layers for outdoor play. It will be good practice for the inevitable snow soon on its way! 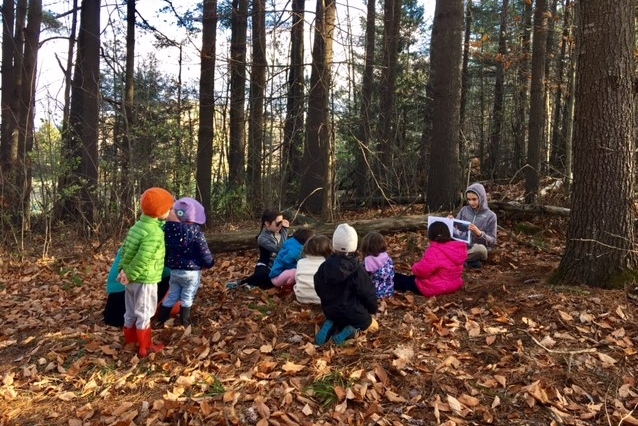 The mild weather gave us many opportunities for exploring the field and forest on the school grounds this month. Jessamine and I observed so much joy as the children searched through the autumn leaves and moss, clambered over logs, and gazed up at the canopy of our stand of tall pines. We would like to take the children outside one morning a week as weather permits. This month, we went on a leaf hunt and explored the different tree species on our property through a leaf rubbing and labeling activity. We also explored graphing this month. One day, we graphed the randomly collected items collected on a woodland walk (leaves, pine cones, bark, etc) and another day we graphed our preferences of apple varieties after a group taste-testing session. In keeping with the apple theme, we explored the language of parts of the apple and sliced countless apples to dry into apple rings to share as a snack during the fall festival. I so enjoyed conferences with parents over the past few weeks. In November, we will invite parents into the class to observe. Stay tuned for information on how to sign up to see the classroom in action! Wow, we have had another busy month! We started this month off with a nature walk. Children explored the school grounds with a brown bag, which they colored before the activity. Children collected pine cones, pine needles, different kinds of leaves, sticks, moss, birch paper, stones, and mushrooms. The children didn’t touch the mushrooms and we discussed how to safely handle unknown outdoor organisms. We then brought the specimens inside the classroom and figured out what we collected outside by counting and graphing each item. We discovered that many children picked up leaves! We discussed that leaves come in different shapes, sizes and margins. We discussed why leaves have veins. We talked about how the leaves also act like solar panels to get energy from the sun. We didn’t forget to discuss the many ways we can use leaves such as leaf rubbing with a crayon, leaf prints, and cutting and perforating. During circle time, we pretended to be leaves! Children loved acting out as falling leaves! The fall season is also harvest time. We have been learning about the parts of apples. We learned the names for the parts of apples such as skin, stem, seeds, core, flesh, and blossom end. One day we made our own apple sauce. We cut up whole apples and then cooked them in a slow cooker. Then we used the food mill. We tasted delicious apple sauce. Then we tasted different kinds of apples. We chose Granny Smith for a green apple, Ginger gold for yellow,and Fuji for red. I was surprised to learn that 8 children liked Granny Smith, 4 liked Ginger gold, and 4 liked Fuji with Fuji being the sweetest. They all enjoyed these activities. Some children tried making apple prints on postcards. 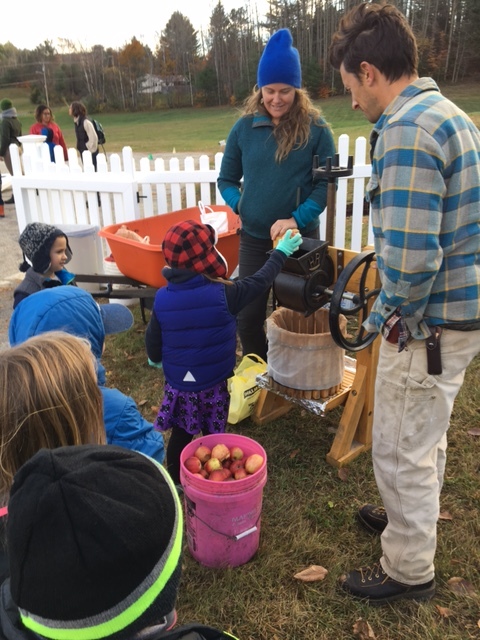 Children also helped make dried Apple rings for the Fall Festival by using the apple corer. It was so fun! We also enjoyed learning about pumpkins! Thanks to the Gilman-Bogie Family, we have enjoyed having the beautiful pumpkins in the classroom. Children were delighted to feel the smooth skins and rough stems. They measured how wide and how big they were by using measuring tape. Before the Fall Festival, we carved pumpkins. 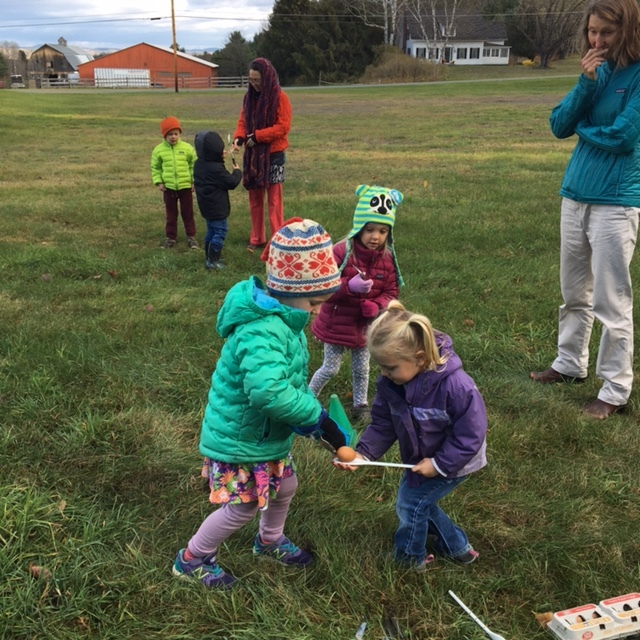 Children enjoyed an activity called “ scoop the goop.” They were delighted to see that the largest pumpkin had the largest seeds, and the smallest had the smallest seeds. The goop (pulp) was all soft, cold, slimy, gooey, slippery, and mushy inside! As the seasons change, we would like to make sure all children are getting enough sleep and staying on a healthy diet. Thank you for packing a nutritious meal for your child each day. Children separate perishable and non perishable items from their lunch bag upon arrival (We keep perishables in the fridge). We have been talking about good food and nutrition, and how it maintains a healthy body. We will explore more next month! This month the classroom has been busy learning about the parts and life cycles of apples and pumpkins. They thought it was particularly comical that the part of the apple they eat is called the flesh. It was great to also see the children working very hard to take care of the pumpkins we kept in our classroom. They learned how to scrub the pumpkin to keep it clean and, thanks to the unusually warm weather, check to be sure it hadn’t started to rot. We were able to cut one of the pumpkins open and sort out and count the seeds – 254 seeds were inside our pumpkin! It was a big job to count so many seed, but we found that it was easier to first put them into groups of ten and see how many groups we ended up with. The children had a blast at our Fall Festival on Halloween day! We were also able to enjoy a festive Fall snack of Pumpkin bread and apple rings. Prior to Fall Festival, our classroom helped make some of the apple chips by using our fancy apple peeler that peels, cores, and slices. We then put them onto trays and into the food dehydrator. They thought that was just about the best thing ever! It seems that cooler weather is finally coming, so we will be sending home warmer weather clothes to make room in the cubbies for winter extra clothes. As it gets cooler, please remember to send your child with layers and plenty of extra clothes.